The classic American sportsboat brand Donzi turns 50 this year, and to celebrate the marque's parent company, Baja Marine, is bringing out three new boats in an Anniversary Edition Donzi Classic series. The boats are the Classic 22, Classic 18 and Sweet 16, and all feature the same sharp, retro styling that will transport many lovers of the brand right back to its 60s and 70s heyday. 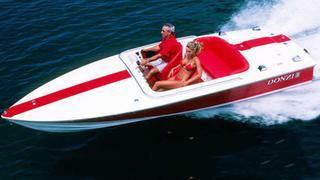 Donzi was established back in 1964 by legendary boatbuilder and racer Don Aronow in Miami. He took the name for the company from his secretary's nickname for him: 'Donzi baby'. Today, bigger Donzi craft are only available on a factory-direct basis, but Baja Marine CEO Johnny Walker said these three new anniversary boats would be available through his company's dealer network. Each of the new boats will feature an exclusive, custom-designed Donzi 50th edition logo, and they will be powered by big block V8 engines, promising the kind of seat-of-your-pants ride that would have made Aronow proud.